What is Clear Choice Water Treatment? Clear Choice spa/water treatment contains a non-toxic surfactant (soap) that breaks down organic waste to a smaller size. The smaller waste particles allow for a much faster natural oxidation process to occur. Our spa water treatment also contains a special nutrient (food source) that sustains the healthy bacteria we need but will not feed any type of infectious bacteria we do not want. This ensures that the enzyme system stays alive and healthy between soakers and swimmers. The ingredients in our product are a blend of several types or classes of natural enzymes and co-enzymes that rapidly start the natural oxidation process and the self-purification of your spa/pool. This natural spa water system was invented by a leader in the natural bioremediation field who has replaced traditional toxic chemicals in a multitude of industries including medical and dental, food processing, agriculture, wastewater, recreational waters, meat packing and aquaculture. More information is available on the 'About Clear Choice' page. What will my local hot tub dealer tell me about Clear Choice? 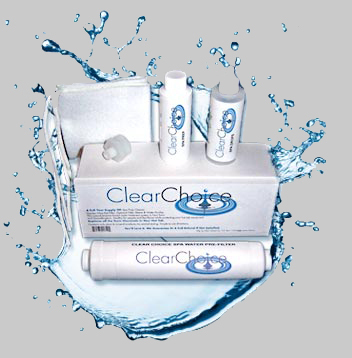 Many retail spa dealers around the world carry the Clear Choice system. Some retail spa dealers are unconvinced of our approach or simply do not wish to offer this type of cutting-edge alternative to chemical solutions. The typical spa store applies a 100% mark up on spa chemicals and the majority of store profits come from chemical sales. This situation limits spa store profits in this manner because the Clear Choice system replaces several products and the income that they generate. We do have the most cost-effective and natural total spa system on the market today. We also have doctors, clinics, natural food stores and other retailers that choose to sell our products. How will Clear Choice affect my hot tub plumbing and mechanical parts, etc.? Your spa's regular filtration system is designed to circulate your hot tub's water and introduce plenty of oxygen. Combined with the Clear Choice product and clean water, as the heavy metals and minerals are filtered out, your spa's circulation system then acts as a bio-filter that traps waste as the water flows by and houses the healthy bacterial colonies needed to biodegrade that waste and purify your water. This natural system will contribute less wear and tear to your Spa's mechanics than normal chemical additives. How much does it cost compared to traditional spa maintenance? You will spend less time and money maintaining your hot tub with Clear Choice than with any other purification system on the market. Much less. How long has Clear Choice been proven to work? This natural system has been on the market for 12 years with great results and many satisfied customers. We are unaware of any claims or problems associated with health issues or performance...and it has been 12 years. Quite the opposite! Our customers are extremely loyal and LOVE the effects of the enzymes on their overall systems in replacement of the old chemicals ~ see 'Testimonials'. Do I have to purge my new hot tub in order to use Clear Choice? Yes. A new hot tub is not necessarily a pure, clean system. Sometimes chemicals or other contaminants are run through at the factory, or the hot tub is not cleaned to Clear Choice specifications. To make sure your new hot tub runs worry-free, filter as directed in our easy-to-follow setup process. How often should I use the 'Prep Spa' product? Use this every time you drain your hot tub, which should be about every 6 to 12 months. If you have an extra-scummy or old hot tub, you may need to use it a few times initially to thoroughly clean the insides of the tub. Do I add the 'All Natural Spa Water Purifier' when I am using the 'Prep Spa'? No, there are enough enzymes and other natural cleansers to do the job for the recommended period of flushing. Is it safe to use the hot tub when it is flushing? Yes, and it feels great. Is it really necessary to use the 'Clear Boot' when using this system? Using the Clear Boot helps tremendously in moving a lot of the old debris out of the tub rather than re-circulating it all through the tub's filtration system. On occasion, we come across a model of hot tub or spa where the Clear Boot doesn't fit properly. Therefore, they are more helpful than necessary for use in conjunction with the other products for clear, naturally-balanced spa water success. How do I install the Clear Boots? 3” or 5” boots are installed on 1 or more intake grills, located at ankle-height in the spa foot well area. The grill is the place where a spa pump draws in water for circulation, filtration and jet activation. You can install as many Clear Boots as desired, but normally 1 or 2 placed on grill(s) that connect to the spa's constant or timed filter cycle system is adequate. To install boots, roll out the elastic edge, like putting socks on a child, then fold over into place. This is extremely easy. If, after installing the Clear Boot, you find that it is restricting water flow through the attached lines or is causing your spa pump to shut down or falter, simply cut a small hole in the center of the Clear Boot to improve water flow. Try placing the Clear Boot on another intake grill or just stop using them. Your spa will function just fine without using the Clear Boots on a full-time basis. .
How long will the start up kit last? The start up kit comes with everything you will need for 6 to 12 months, depending on individual spa usage. What is the shelf life of the 'All Natural Spa Water Purifier' and 'Spa Prep' bottle? If kept in a cool, shady area the ingredients will stay active for up to 2 years. You will know if the ingredients are no longer good if they have a foul or unpleasant smell to them. Can I reuse the 'Clear Choice pre-filter' for the garden hose to fill my tub? The filter has a 350-500 gallon capacity to successfully filter out all of the unwanted minerals and metals of the water for your hot tub. It's best to use one filter to fill the hot tub and to top it off until the next time you drain and fill the hot tub again. Then, ideally, you would start over with a new pre-filter. How often should I clean and/or change my spa filter? You will want to clean your spa filter once a week (as per instruction sheet) and put in a new one each time you completely drain and fill your tub. Weekly - rinse with high pressure water. Monthly - soak overnight in clean water and 3 cups of white vinegar. Rinse spa filters and Clear Boots well with high-pressure clean water before re-installing into spa. Will Clear Choice still work if I have an ozone or ultra violet light installed in my spa? Yes, it is not necessary to have either one of these in your tub for our products to work and Clear Choice will not interfere with either of them if you do have them installed. Can I use the Clear Choice Water System in Soft tubs & small spas? Do I need to check pH & Alkalinity? Normally, adjustments are not needed. The Clear Choice System will automatically settle water pH at 7.8 through 8.2 and stabilize alkalinity. Your spa and skin are protected by the water pre-filter and special conditioning agents contained in the Spa Prep and One Step Spa Water Treatment. How do I know if I used too much of the 'All Natural Spa Water Purifier'? Using too much Clear Choice is the most common problem with this system. Initial overdosing symptoms are excessive buildup of amber or brown residue at the water line and/or around jets. This can also be accompanied by green or brown tinted water. Soon after, the water clarity and odor will be affected. Clean your spa filters and Clear Boots daily, skip your next 1-2 treatments When you resume weekly spa water treatment; reduce your dosage amount and clean spa filters & Clear Boots as directed above. Soft, odorless & colorless residue on spa surfaces are caused by harmless salts that will dissipate with time. I have white cloudy water? After water changes there is often a 1 or 2 week period of time when water is softening and changing molecularly. During this period water may look white & cloudy with no signs of overdosing. Add 1/2 of normal spa water treatment dosage amount immediately, then rinse your spa filters & Clear boot thoroughly with clean water the following day. Sometimes soft or hard deposits will form on the spa shell. This can be a result of some final chlorine or bromine salt deposits being flushed from your spa's plumbing system that the 'Spa Prep' purge did not completely remove. Normally, these deposits will break down and disappear within 2 weeks. If deposits remain, add 2 cups of white vinegar to spa water. After 2 days, repeat vinegar treatment if necessary. Deposits will then normally disappear within a week. This is harmless and should disappear with time. Normally, this is caused by residual metals in the water that are oxidizing. A green tint can also result from not using a new pre-filter on your hose when adding water to your spa. Metals, like copper or nickel, in non-filtered water are prone to oxidizing. This is normal for new customers during the first 1-4 weeks as the natural spa water sets up. With time, this odor (trapped Co2 gas) will only be noticeable when you first open your spa cover and release the steam. Light flakes in the water are non-toxic buildup from spa’s plumbing system. Clean spa filters & boots more often. If flakes persist, add 2oz of Spa Prep & 5 cups of white vinegar to spa water, wait 6-12 hours, then change spa water. To prevent continual build up, adjust and maintain the spa water pH to 7.2 through 7.6 using traditional pH spa products, if you feel this is necessary. What if I have a brand new hot tub or spa? Check and maintain a water pH of 7.6 for the first 2 months using pH test strips and any common pH-lowering product available from your local pool and spa supply store. After that, periodic pH adjustments should not be necessary as you continue to use and enjoy the Clear Choice system.